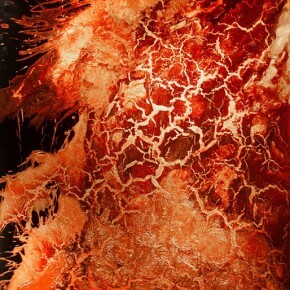 Most notable is Jordan Eagles, a New York-based artist who uses blood to create glowing abstract works. Sure, it’s a gimmick—one appropriate for Halloween and the Day of the Dead (which fell on the exhibition’s opening night). 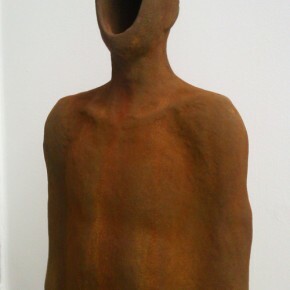 But the work also resonates with metaphorical associations, and a magnetic visual appeal. 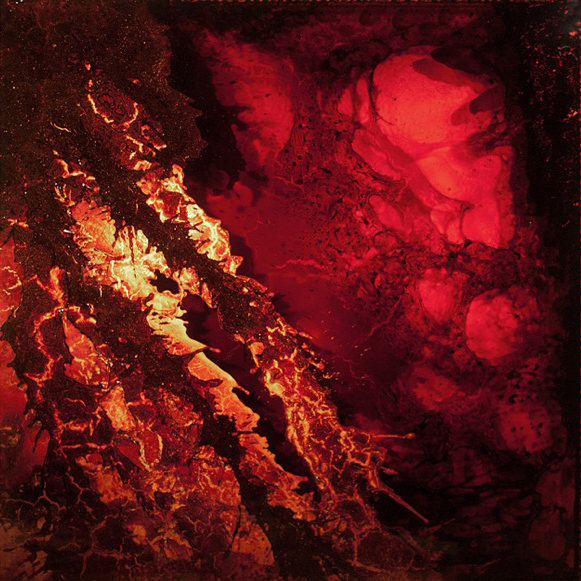 The blood (from animals, not the artist himself) is mixed with copper and captured in clear resin so that blacks, scarlets and ambers reflect out and shine within, making the works resemble glass art as much as paintings. The works point to the infinities, both of the macro—you’ll catch yourself thinking of fiery nebulae in deep space—and the micro—the cellular division apparent to the naked eye in some of these pieces continues at a microscope cellular level. 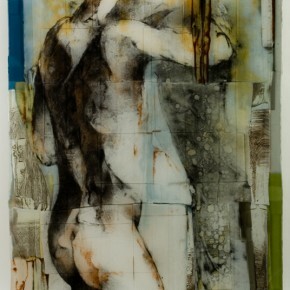 While Jeff Wallin’s work actually is glass art, these fused sheets of kiln formed glass call to mind delicately layered paper collages and traditional figure studies. 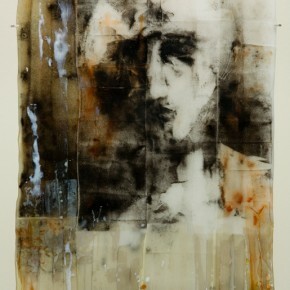 The artist works directly with glass powders on a glass sheet, and the final results are full of wonderful colors and textures (including instances of cellular division that in this context seem to reference Eagles’ work) with melancholy portraits and figures rendered in what ends up looking like translucent sheets of charcoal on paper. Finlay, adorning the gallery’s floor space is the work of sculptor Emil Alzamora. 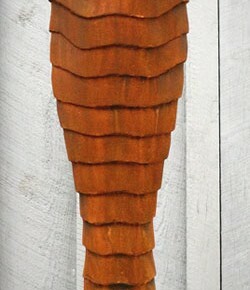 Two related pieces, covered in iron oxide, are executed to look like sarcophagi, arms welded to the torso and legs and feet forming one solid swoop. “Shell” is covered in stiff, overlapping layers, creating a fortress-like, protective shell, while “Core” looks like the revealed body within the sarcophagus, with a haunting void where the face should be. A third work, a mass of rotund forms being squeezed out of each other, is markedly different from the linear quality of the other two, but is no less corporeal. Alzamora calls it the “Venus of Venus” and it’s his exaggerated homage to the “Venus of Willendorf,” a 25,000 year-old sculpture that reminds us of just how much this art thing is in our blood. 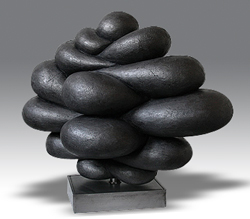 Shell by Emil Alzamora 41″ tall. Base is 10″ x 10″. Fiberglass reinforced gypsum and iron pigment. Corpo/Ethereal, featuring work by Jordan Eagles, Emil Alzamora, and Jeff Wallin, is at Ogden’s WHITESPACE through December 30.